6th car very similar to this pix. A 1950 Chevrolet Army ambulance, and this is sketchy, but I sorta of remember it being Army green with a couple of white circles with red crosses on 'em. Another $150 purchase driven off the lot from a used car dealer somewhere close to Reisterstown. I drove it only, once from the lot to a farm I was living on at the time in Hanover PA. Never made it out of the barn after that. Blown engine. Think we just left it there when we left the farm to come to Miami. No real stories to tell about this one. Seemed like a great idea at the time. Just loved the shape. 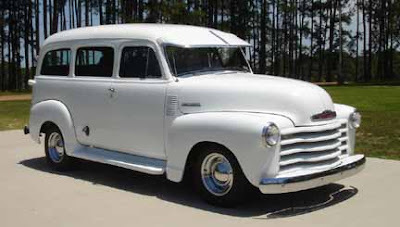 Didn't have SUV's back then, but if this wasn't an ambulance, what would you call it?